The election is on Tuesday. 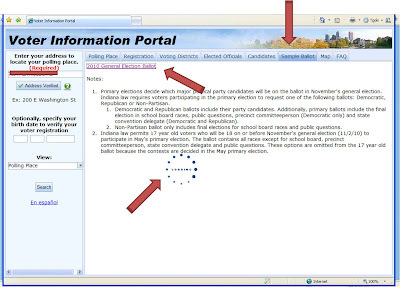 If you have questions - like where you vote and what your ballot will look like, there is a really helpful 'Voter Information Portal' on the City Clerk's Election website. Enter your address in the box that the top red arrow pointing at, and click the 'verify address' button. Once the address is verified, the 'search' button, noted with the bottom red arrow, will become active. Fill in your date of birth in the boxes provided, if you want to find out if you are registered to vote. You do NOT have to fill in your birthdate to proceed. Select any particular item you wish in the 'view' dropdown box. All of the options will remain available when you get to the next screen, so you can choose to leave this at the 'polling place' option. When you have filled in all that you wish to, click the 'search' button. Depending upon what 'view' you selected in the dropdown box on the first screen, you will see one of the tabs at the top of the screen open (highlighted with the top red arrow). I wanted to see the ballot, so I clicked on the 'sample ballot' tab. That led to this screen. I got stuck on this screen, waiting for the 'loading' circle to stop spinning (I've highlighted that with the bottom red arrow). Just ignore that spinning icon and click on the hotlink '2010 General Election Ballot', to see the ballot as it will be in your voting place. 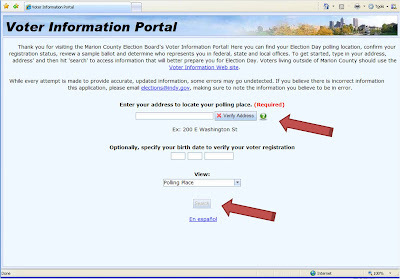 This Voter Information Portal is fat with information that you may want to have before Tuesday. Sometimes, when I go long between posts, it is because I have other things I must get done. Once in a while it is because I don't have anything to say. This time, it is because I have too much to say and needed to let things perk for a while. I guess the core of it all is that I am so very disappointed in those Republican Councillors for whom I have some personal respect. Not that my opinion will carry any weight with them - or even should. But, with the exception of Councillor Christine Scales, the Rs have clearly demonstrated that they will get in line and do whatever their party leaders want them to do - regardless of what it means for their constituents, or for the City's welfare as a whole. Last Monday night's vote on the CIB budget is just the latest in a string of truly bad decisions - all of which have just eeked by with the minimum of votes. There was the vote last year, to approve the requisite zoning on 450 E. Market Street - that was the Council's only bite at the apple to shut down a plan by Mayor Ballard to spend $18 million on a garage that was only worth about half that, and give tens of millions of dollars of property to Tadd Miller Enterprises. There was the hotel tax increase and the grant of permission for the CIB to take in a $27 million loan from the State - with no idea how they would be able to pay it back without raising yet another tax in 2012. Barnes & Thornburg lobbyists Bob Grand and Joe Loftus, who have insinuated themselves firmly in charge of the Mayor's office and now the Council, through Council President Ryan Vaughn, pushed all the levers to get their clients more money through the CIB. Hoteliers shamelessly hid behind the maids' skirts in order loosen the City's purse strings - then even more shamelessly, outsources the maids' jobs. The sale of the sewer and water utilities had some bright spots. I think that Chris Cotterill tried to make as much information available as physically possible. Unlike others on the 25th and 23rd floors, he and Dave Sherman tried to sell the sale on the basis of facts and figures. Many people disagreed with them on the final decision - but it was an honest debate with honest differences of opinion. The parking meter deal is cut from a very different cloth. What we are seeing now is a formula - make a PR push and keep to a script in order to sell the deal - but, make sure you do not share all of the relevant facts. We are seeing the very same thing with the North of South project. But shades of this formula have been visible in the Council review of the CIB budget - particularly on the $10 million to be given to the Pacers in 2011, $8 million of which is from property taxes shuttled through to the CIB in a process that was the antithesis of transparency; it deliberately kept the deal from the light of day and any public scrutiny. There was much wringing of hands and gnashing of teeth and pseudo hard questions volleyed at the CIB representatives. All theater. And the act is getting old. A friend of mine quipped, "Its amazing how much posturing can be done by a governing body with no spine." Its all sad for Indianapolis. Lobbyists are in charge. Those folks elected to serve their constituents' interests, are instead serving their Party's interests. Its an abdication of their responsibility. And a mighty few are getting more and more wealthy because of that abdication. The bill keeps getting paid by the taxpayers and the ratepayers, and the bills will keep coming due for the next 50 years. Tonight's City-County Council meeting will see final adoption of the various budgets for the City, County, and municipal corporations. The CIB budget has become the poster child for how to glam up the usually boring budget process. Just try to pass $8 million of property tax money to a sport organization; that's apparently all it takes. The rest of the budget should pass in with little excitement. The CIB budget, however, is different. It is time for the individual Councillors to take a stand on the movement of $8 million in property taxes from the consolidated downtown TIF to the Pacers, through the CIB. They can amend the proposed budget to redact the $10 million total gift, or just vote against the budget as it now stands. If no new budget is approved, the CIB would have to live on the same budget as last year. Although the CIB cried wolf throughout all of their bailout hearings in 2009, they still managed to pad the 2010 budget enough so that there was an extra $10 million in it to give to the Pacers. If you compare the proposed 2011 budget ($104 m) with the approved 2010 budget ($94 m), there is a request for $10 m extra dollars. But, if you compare the proposed 2011 budget ($104 m) with the amount expected to actually be spent in 2010 ($85 m) you find a huge increase, amounting to nearly $20 million in new dollars. And remember, that $85 m figure includes the $10 million 2010 installment of the Pacers gift from the taxpayers of Indianapolis. As some Councillors will try to tie the IndyGo and Library budgets to their CIB vote, let me remind everyone that IndyGo got the budget it asked for and the Library got $800,000 less than it asked for. IndyGo's 2010 budget is $75.7 m, while its proposed 2011 budget is only $63.5 m; a $12.2 m reduction. The Library's 2010 budget is $49.5 m, while its proposed 2011 budget is only $45.2 m; a more modest, but still real, reduction of $4.3 m.
Isn't it time the priorities for how we spend tax dollars get put on services for Indianapolis residents, rather than on bailouts for sports teams? It is time for the Council to say clearly to the Capital Improvement Board - "enough". We shall see how each Councillor votes tonight, after all of the hand-wringing and declarations of it being a hard decision are over. Remember folks - it is your money they are spending. The North of South development is the next big thing to be promoted by City officials. Presumably their timetable had been predicated upon the completion of the parking meter deal by now. North of South is anywhere from 10 to 14 acre development proposed for land owned by Lilly and just north of their main campus. A rezoning petition is in process, and is scheduled to be considered by the Metropolitan Development Commission on November 17. Just yesterday, the economic development committee of the MDC heard for the first time, details about the proposed deal between the City of Indianapolis (who would finance the lion's share of the project), Buckingham Companies (who would develop and own the project), and Eli Lilly (who developed the plan and who will continue to own the land upon which the development would occur). The Commissioners requested that their vote on this proposed deal also be postponed to November 17. At the moment it is scheduled for November 3. Should the MDC approve the proposed deal, it would move to the Council for its verdict. The City hopes to be floating the bonds before the end of the year. I made an open records request for the proposed deal, and received a document titled "Memorandum of Understanding As of September 27, 2010 With Respect to North of South - Mixed Use Development". I have posted that document. (you will need to sign in with a google account to access it -- if you just want me to email it to you, please send me a note to hadenoughindy@gmail.com) This document alludes to two attachments, neither of which did I get. I have requested those, and when I get them, I will post those as well. Between the presentation at yesterday's MDC committee meeting and the MOU, here are the details of the proposed deal. Two years ago, Lilly began planning for the undeveloped ground it owns north of its main campus. It currently serves as parking lots, primarily. One year ago, the City entered the picture, and has been working with Lilly and Lilly's chosen developer, Buckingham Companies. Lilly sees development of the area as a means of creating a link from downtown to the southeast quadrant and as a way to create a sense of place that is 'interesting and energizing', which would help them attract and retain talent. The Lilly representative at yesterday's meeting said they had chosen Buckingham because of their commitment to Indianapolis, and their 'strength both financially and in developing this kind of thing'. The exact square footage, like the acreage of the project, shifted slightly, depending upon who was talking. Therefore, I will stick with the MOU and the presentation yesterday of Deron Kintner, Executive Director of the Bond Bank, and evidently the City's spokesman on the deal. He relied upon a PowerPoint presentation, which I have also uploaded. the MOU mentions 'parking garages' as well. The City would float a bond large enough to generate $86 million in cash for the project, plus $8 million to cover the first three year's payment on the bond - those three years being interest-only payments. More on how the bonds would be paid off later. The City proposes spending $9 million from the consolidated downtown TIF on infrastructure improvements - roads, sewers, sidewalks, and the like. The City would also pay $14 million back to Lilly for a loan Lilly made on the Harding Street TIF in 1991. This money would become Lilly's cash contribution to the project. It also will be allowing the development to occur on its land, valued at $14 million - but would retain ownership of the land. The YMCA is expected to cost $18 m, most of which was said to be coming from a 'significant donation' from the Lilly Foundation. Buckingham has to come up with its own cash investment of $7.5 million, plus about $6.25 million to be set aside as insurance of one year's bond debt payment. The latter could, instead, be guaranteed by a letter of credit or similar instrument, instead of with cash. The City considers the total contributed by the Developer and Lilly to amount to $41.75 million - but it could be argued that the $14 million for the land isn't really a cash investment, the $6.25 million to be set aside for one year's debt payment isn't cash if its just a line of credit, and the City is providing the $14 million cash to Lilly - which would drop the actual developer/Lilly investment to $7.5 million. In addition, there is the $18 million for the YMCA, evidently to be supported by a Lilly Endowment grant to the Y. More investment money is expected from the State. Indiana Economic Development, Inc., is supposed to give $6 million to the development. The 10,000 square foot office portion of the development, is anticipated to contain within it, a wetlab, which is evidently being used as the hook to get the State to designate the entire project a 'Certified Technology Park'. CTP designation allows income, sales, and use taxes that usually go to the State, to go to the City instead. This could add up to at least $5 million for the City, who through the MOU, has agreed to send it to the developer for either project development funds or repayment of the bonds. The bonds are to be repaid by the developer within 10 years, unless the agreement is extended at that time. Except, significantly, ALL property tax money generated by the project will be used to pay down the amount of money that the developer has to come up with. The first three years payments are interest only, and will come from the $8 million portion of the bond mentioned earlier. In year 4, the developer's payments begin. The City, in its presentation yesterday to the Commissioners, and in its statements to the press, have downplayed the contribution of the property taxes to the repayment of the bond. These funds should definitely be included in the cost to the City, just as Kintner included the abated taxes as costs to the City in other developments he used for comparison. Kintner estimated the property taxes to amount to $1.7 million per year, which over 7 years, amounts to just under $12 million. Under the proposed agreement, the City would get the first mortgage. The Lilly representative said yesterday, that Lilly would get the second mortgage on the project. While Kintner is trying to present the proposed development as a $155 million deal that costs the City only $9 million, I would beg to differ. This proposal would cost the $9 million for infrastructure improvements, the $12 million in property taxes that would be applied to the bond payments, the $5 million for the Certified Technology Park designation, and the $14 million cash to repay Lilly for the loan back in 1991. That comes to $45 million. And, that is only if the project is a success. If it is not, then the City and its taxpayers will be on the hook for the bond payments and own a partially completed project that will undoubtedly need another infusion of cash. The risk is all on the City here. In addition, the City will use Buckingham Construction as its construction manager for the City's infrastructure projects, with City paying Buckingham an undefined amount of fees for those services. Of interest is one item in the MOU and another mentioned yesterday, regarding Wellpoint, which leases a building abutting this area. Kintner mentioned that their lease is up in 2015, and the City is already talking with them. The MOU mentions that the City is 'obligated' to build Wellpoint a parking garage. Its Raining in Indianapolis - Raining Money, That Is ! Are you rich, powerful -- or just know people who are? Well then, Indianapolis is for you. We're GIVING money away ! Not chump change -- but MILLIONS ! You could be our next recipient ! Come on down !!! Just call 1 (800) BAL-LARD !!!!! void where prohibited by law -- aw ! forget that -- for YOU, we'll pretend it meets all our laws ! Don't walk !! Run !! Call 1 (800) BAL-LARD !!!! The Municipal Corporations committee passed the CIB budget, without amendment, to the full Council with a do-pass recommendation by a vote of 5 - 2. Voting for the budget, which includes $10 million gift to the Pacers, were: All of the Republicans - Malone, Lutz, Cardwell, and Rivera - and one Democrat - Nytes. Voting against were two Democrats - Dane Mahern and Maggie Lewis. Tonight, the City-County Council's Municipal Corporations committee will do the final review, revision, and vote to move all of the municipal corporations budgets out of committee. There are 5 municipal corporations - the Airport, Health & Hospitals, IndyGo, the Library, and the Capital Improvement Board. The Airport and H&H budgets will enjoy little to no drama tonight. This is not the case with the other three. Will Higgins reports in this morning's Indy Star, that there is a deal to replace all of IndyGo's and much of the Library's proposed shortfall appeal with money set aside when the United TIF was created. What's a shortfall appeal? Its easiest to explain by starting with how a tax rate is determined. You determine a tax rate by dividing the amount of property tax requested in a budget, by the assessed value of all property that will be used to pay that property tax. The taxing unit, whether it be a school, a library, or the City, are bound by the property tax rate. If somebody doesn't pay their taxes, too bad. If the property owners appeal their individual assessed value, and win, then the total assessed value drops. This, too, reduces the property tax revenue that the taxing unit gets -- unless it files for a property tax shortfall appeal. If granted, the next year's tax bills will show an additional line for those properties that have not already hit the tax caps - raising those property tax bills. In the case of IndyGo and the Library, a shortfall appeal cannot be submitted to the State Department of Local Government Finance without the prior approval of the Council. If granted, the additional tax would be applied to next year's tax bill -- just in time for the reelection campaigns for Mayor and City-County Council. And, none of those folks want to HAVE to be explaining how its REALLY NOT a tax increase. A bipartisan group of council leaders on Monday agreed to recommend adding $1 million to the library's 2011 budget, partially offsetting the library's property tax shortfall appeal request for $1.8 million. The group's plan also would provide IndyGo with the $1.5 million it initially sought in its shortfall appeal. The money would come from a fund created in the 1990s to service debt from a tax-increment financing district that helped finance the former United Airlines maintenance hub at Indianapolis International Airport. Under the proposed deal, the funding source would be recurring for the library but a one-time-only fix for the bus service. This deal would not increase the proposed budget for either IndyGo nor the Library - and actually would decrease the Library budget by $800,000. Members of both parties say they are reluctant to approve the CIB's budget. Council President Ryan Vaughn, a Republican, says it's a tough call when the library and bus systems' long-term fiscal health is in question. "I think people are open to passing it as long as we are finding solutions to the library situation," Vaughn said in an interview. "We want to work hard to send the right message to the public." We shall see what happens tonight. Will the Councillors on the committee think that not cutting the proposed IndyGo budget and cutting the proposed Library budget by only $800,000, is sufficient trade for $10 million to the Pacers in the CIB budget. If they do, then Councillor Vaughn is correct - if that deal is struck, the Councillors WILL BE FORCED to "work hard to send the right message to the public." I say that because I don't think the public is that dumb or ill-informed. Councillors serving on the Municipal Corporations committee are: Republicans, Barb Malone (Chair), Jeff Cardwell, Bob Lutz, and Angel Rivera -- and -- Democrats, Maggie Lewis, Dane Mahern, and Jackie Nytes. The meeting begins at 5:30 in room 260 of the City-County Building. Did the CIB Really Need Those Tax Increases & Loans? Remember the CIB bailout saga over the last two years? Back in early 2009, the CIB and its local allies, pleaded with anyone at the Statehouse who would listen. Everything was bleak. They absolutely HAD to have $43 million more money for operations and $43 million to avoid catastrophe with their bonds. Lucas Oil Stadium had not yet opened, but it was projected to cost $20 million a year more to operate than the old Hoosier Dome. The Legislature ultimately gave the City-County Council the authority to increase the hotel tax, increase the footprint of the Professional Sports Development Area, and the opportunity to get a $9 million per year loan from the State for each of 3 years. Unpopular though it was, and armed with assurances that none of the money would be given to the Pacers organization, the Council passed the Legislature's bailout package in 2009. Given the dire prognostications, and the fact that the Legislature and Council actions would increase annual revenue by $22 million at the most, you might think it impossible for the CIB to squirrel away $20 million in 2009 and another $20 million again in 2010. But, you would be wrong. Each year, as part of its budget ordinance, the CIB estimates what the fund balance will be that year, and also what the fund balance will be at the end of the next year - given the budget they submitted for approval. Ultimately, the CIB operating budget for 2009 was set at $65 million. They ended up actually spending 'only' $44 million. Those savings showed up in their fund balance. They estimated the December 31, 2009, operating fund balance at $5.6 million back in 2008, as shown in the 2009 budget ordinance. A year later, they improved their estimate of the December 31, 2009, operating fund balance to $26.0 million. In August of 2009, they estimated that the operating fund balance at the end of 2010 would be $22.8 million, given the budget they introduced for 2010. Now the CIB estimates the fund balance at the end of 2010 will be $45.3 million. To recap, while the Council raised taxes and allowed loans totaling less than $22 a year, the CIB managed to pad their operating fund balance by $40 million in two years. Meanwhile, they managed to give the Pacers $10 million and collect $4 million of property taxes from the MDC this year. So, did they really need the increased hotel tax and the increased footprint of the PSDA and the loan from the State? Like a modern day Punch & Judy show, a complex marionette dance has been playing out, with the real actors just out of sight, behind the curtains. The characters have been the Capital Improvement Board, the Pacers, and the Metropolitan Development Commission. Behind the curtain, has been Mayor Greg Ballard and his administration, Barnes & Thornberg, and possibly the City-County Council. A document uncovered by WRTV investigative reporter, Kara Kenney, lays bare the fact that the Administration was plotting for the transfer of property tax money from the Consolidated Downtown TIF district even as it was finalizing the deal between the Pacers and the CIB. That deal calls for the CIB to pay the Pacers $10 million a year for 3 years, plus make $3.5 million in improvements to Conseco Fieldhouse that will increase advertising revenue for the Simons. The document is dated July 19, 2010, and is a memo from Barnes & Thornberg and Bingham McHale, two law firms, to the City Controller, David Reynolds. There are no authors specified. The title of the memo is "Council Appropriation of Tax Increment (TIF) Funds". The gist of the letter is that Council review is not required for the MDC to spend TIF revenues. This memo will address whether the allocated property tax revenues under IC 36-7-15.1-26 commonly known as "tax increment" are required to be appropriated by the City-County Council of the City of Indianapolis and Marion County (the "Council") before being spent by the Metropolitan Development Commission of Marion County, acting as the Redevelopment Commission of the City of Indianapolis (the "Commission"). For the reasons discussed in this memo, our conclusions are that (1) Tax Increment funds belong to the Redevelopment District, as a special taxing district and political subdivision separate from the City, (2) the Commission has sole authority under the Redevelopment Act to expend the Tax Increment, (3) Tax Increment is not required to be appropriated before being spent by the Commission, and (4) Council approval of the Commission's expenditure of Tax Increment is not required. I will leave you to read the entire document. The memo is clearly in response to a proactive inquiry by Reynolds, on whether the Council must review the property tax money that the Administration was hoping to send to the Pacers via the CIB. What remains unclear is whether the purpose was to devise a funding stream for the Pacers that avoided Council review, or to protect the Council from HAVING to take a public vote on a funding stream for the Pacers. As noted, this letter is dated July 19, 2010. The CIB - Pacers deal was announced on July 12. The strings were already being pulled months ago. This letter is being cited often by the Administration, as proof that the Interlocal Agreement does not require Council review. But, the legal opinion is only about the MDC spending TIF revenues. It does not cover what the CIB can do with the money it gets from the MDC. Nor does it cover the vehicle ultimately chosen to send the TIF money to the CIB. That vehicle was the creation of an Interlocal Agreement between the CIB and the MDC. That is governed by its own set of laws - IC 36-1-7. Section 4 states that the 'fiscal body' of the parties must review and approve any interlocal agreement. The Council is clearly the fiscal body of the CIB, as evidenced by its sole authority to appropriate funds for the CIB's budget. The puppet master got a couple of his strings twisted. Also being mentioned in response to public questions on the Interlocal Agreement, is that the MDC and the CIB had public hearings on the matter. Not actually true. Sounds good though. This is supposed to quell the misgivings that the public has about how sneaky it all has been. The CIB voted on the Interlocal Agreement on August 30, 2010, as part of its budget. You can view it in the WCTY archives (click here, then on Aug 30, 2010, video). It comes up between time stamp 41:58 and 42:31, with random, insignificant, references after that. At time stamp 46:40 to 48:04, President Lathrop calls for a vote on the budget along with the Interlocal Agreement. At no time does she ask for public comments nor mention a public hearing on any matter. RESOLUTION NO. 2010-B-024 Approves an Interlocal Cooperation Agreement with the Capital Improvement Board of Managers, Marion County, Indiana. That's it. That's all. Nothing more is there. Even the Pollyanna in me thinks that the summary was expressly designed to keep this deal under the radar. Even if you saw that summary before September 1, why would you think it had anything to do with the transfer of $8 million a year, of property taxes no less, to the CIB? Real, honest, public notice of the consideration of the MDC-CIB Interlocal Agreement was never made. And neither body held a public hearing. The matter of the CIB budget is now before the Council's Municipal Corporations committee. Any amendments and a final committee vote is set for next Tuesday night, October 19. The full Council will vote on the CIB budget on October 25. Was the purpose of the memo unearthed by Kenney, to keep the MDC actions from the Council, or to protect the Council from having to take a public vote to approve the transfer of property taxes to the Pacers via the CIB? The Council can answer that question by stepping up and claiming its legal obligation to review any interlocal agreement that includes the CIB. The public has a right to know which side of the Punch & Judy curtain the Council is really on. The end of the budget sessions are now in sight. The City-County Council committee meetings will begin focusing on amendments to previously discussed budgets started Thursday and will resume on Tuesday. Monday night, however, sees the very last of the budget review and public comment sessions. Saving the most controversial to last, Monday night the Municipal Corporations committee will review the 2011 budgets for the Capital Improvement Board and the Health & Hospital Corporation. This meeting begins at 5:30 pm in room 260 of the City-County Building. The Admin & Finance committee meets on Tuesday night and will vote their portion of the budget out of committee. The Public Works committee will not meet this week; postponing its final budget consideration until October 21. Today I post information about how much excess cash is sitting in the various TIF districts in Indianapolis. Some of the TIF names are slightly different in this document than in yesterdays, but the identity can be ascertained by using the TIF district number. The total amount of the fund balance of all Indy TIF districts on 3/31/2010 was $91 million. As Francesca Jarosz reported a week or so ago in the IBJ, 10% of an annual payment, or more, must be kept as 'excess' cash in some TIF districts to satisfy the requirements of bond rating agencies. I had heard 30% previously. But, otherwise, it is money that can be spent to pay debt early or engage in projects that bear fruit for the residents of Indianapolis, not just the business owners. The consolidated downtown TIF, which was recently raided in order to send $8 million of property tax revenues to the Pacers, via the CIB, had $51 million in fund balance at the end of March. That is nearly one full year's revenue. The airport TIF (aka the 'united TIF'), interestingly enough, had $13 million excess cash. This is interesting because the property tax revenues are just over $1 million short each year to cover the bond payments due. They cover the shortfall with County Option Income Tax revenue. But, if this cash is sitting there, then why not save the COIT funds for other uses? Also of interest to my eye, is that a retired or 'dormant TIF', has a pretty big bankroll sitting there. That is TIF district number 640, named the 'Dow Elanco' TIF in yesterday's document, but the '86th Street TIF' in this one. There is over $8 million sitting in that old TIF. Now an excellent question is, WHY? Does someone think that it is a slush fund for every time Dow Elanco wants another financial assist from the taxpayers? Shouldn't that money be returned to the usual property tax recipients - like the Pike school district, the Library, Pike Township government, IndyGo, etc? Likewise, two other 'dormant' TIF districts have some money sitting in them. Perhaps the residents of those areas have some idea for good ways to spend that money that will enhance their quality of life? $91 million dollars is a sizable pot of money, even if these weren't tough economic times. But, this money and the future handling of the many Marion County TIF districts should not be in the hands of only one person - that being the Mayor. It is time for a community discussion on the proper uses of TIF revenues, and for who should have say in how that money is spent. Right after it was announced that the MDC was going to funnel $8 million a year to the Pacers via the CIB, I happened to be at an MDC pre-meeting where it was noted that the consolidated downtown TIF district took in $43 million a year, but owed debt payments of about $30 million a year(that information wasn't quite accurate -- see below). That got me wondering just how much money is in the various TIF districts around Marion County. I requested information on all of the TIF districts and I now post it here. This document lists all of the TIF districts in Marion County, their ID number, and actual revenue numbers for last year (2008-2009), as well as estimated revenue numbers for this year (2009-2010) and next year (2010-2011). These numbers are the amount of property tax revenue received by the TIF district, how much was due on the bonds and other debt owed by the district, and the revenue divided by the debt payment owed that year (coverage). The 'consolidated allocation area' is the consolidated downtown TIF. It includes 8 distinct TIF districts. The 'airport EDA', also known as the 'united TIF', contains 5 distinct TIF districts. Of 44 TIF districts in Marion County, 8 are in the excluded cities and 6 are 'dormant'. The latter still exist, but the revenue flows through to the usual recipients of property tax revenues - the schools, library, townships, etc. This is probably a good time to pause and outline what a TIF district is. TIF stands for 'tax increment financing'. When a TIF is set up, the assessed value on day 0 is set as a base. All property taxes collected from this base will always be allocated to the usual recipients of property tax revenues. But, as development occurs and the assessed value rises, the new property taxes collected (or the 'increment') will NOT go to the usual recipients. This new money will go to pay off bonds that were floated to give money to the development project. Those of us who advocate for our neighborhoods have always been assured that the debt will be paid off as soon as possible and the new development will then be a benefit to all of the taxing units, not just to the City or the developer. Heck, even the MDC, who votes on the establishment of a TIF district, is told such things. If you look at 'Total Indianapolis', you see that this year all Indianapolis TIF districts are expected to take in almost $20 million more than is due for debt payments. Who can spend this extra? Why, Mayor Ballard pretty much gets to make that decision. The MDC is the only body who is must vote on how to spend the excess. The Mayor appoints 4, the Council 3, and the Commissioners 2, members of the MDC. The Mayor introduces his pet projects through the Department of Metropolitan Development. This is the only pathway for projects to be considered by the MDC. So, only projects favored by the Mayor go forward. 1) pay off the debt early and retire the TIF district so that the benefit from development can accrue to all taxpayers. 2) use it for projects that improve the quality of life for residents, so that they can taste some of the fruit that was promised when the TIF district was created. 3) make an actual plan for improving the area and prioritize where excess revenues go, so as to implement that plan. Planning is something clearly lacking in this administration. It is much more a shoot from the hip, whoever just walked through the door with their hand out, who-knows-who, who hired the 'right' law firm to represent them with the City, sort of administration. If you look only at the downtown consolidated TIF district (see IBJ map here), you see just how much of downtown is consumed by it. The improvements to downtown have been promised to reap benefits to all of Indianapolis. Yet, there seems to be no rush to get those improvements out of the TIF districts and onto the regular property tax rolls. They would appear to be a never-ending revolving door where favored people walk in and get boatloads of cash for their project. These folks are corporate welfare queens. And they get rich while the rest of us pay more taxes to make up for their handouts - their handouts that never seem to end. Meanwhile, our library is cutting back hours and our public transportation system is hanging on by a thread. Yes, the community deserves a real conversation about how best to utilize any excess TIF revenues so that in some small way, the community can actually feel like it is coming out ahead. Are TIF Districts the New Slush Funds? The recent action by the Metropolitan Development Commission to funnel $8 million a year to the Pacers, by way of the Capital Improvement Board, has brought a lot of attention to the consolidated downtown TIF district and how much money is actually there. Last week, Francesca Jarosz, newly transplanted to the IBJ, wrote an article with a great deal of detail - some of it very unexpected ("Downtown tax district reaps unexpected windfall"). There is an accompanying map, showing that this TIF district consumes most of the mile square and much of the area bounded by I-70 and I-65. By the end of this year, the city estimates there will be close to $91 million collected from the downtown TIF beyond what’s needed to make its debt payments. The money eligible to be spent would dwindle to about $24 million after factoring in a $9 million cushion for tax money lost to appeals or non-payments and another $58 million for the city to hold a reserve of 10 percent of its debt. And that number likely will further dwindle to about $12 million, pending the issuance of bonds for the proposed development near Lilly and Clarian Health’s planned neurosciences center near Methodist Hospital. Those would increase the downtown TIF debt to more than $700 million and hike the amount needed for a 10-percent reserve to $70 million. This is an excellent point. Most of us, even those who know what a TIF district is, didn't have a clue that so much money was accumulating. A community discussion on the use of those funds should be a priority. Instead, we see that Mayor Greg Ballard is lining up one use after another for those funds, without setting any forth any vision of what he is trying to accomplish with what appears to be a random and piecemeal fashion of awarding money to favored projects. “If there’s that much excess money, wouldn’t it be wiser to apply the funds to upgrading parking meters or helping to handle the infrastructure deficit or paying off the bonds more quickly?” said Cathy Burton, president of the Marion County Alliance of Neighborhood Associations. Mike Shaver is a Carmel-based community and economic development consultant who works with municipalities across the state. He said it’s common for cities to collect excess TIF funds and use the money for other economic development projects, citing the towns of Seymour and Converse as examples.He said in those cases it’s important for government officials to have a highly public discussion about how the money will be used. Mr. Shaver hit the nail on the head. Because, from the cheap seats, it looks to be exactly the case that Mayor Ballard is indeed using excess TIF dollars as a slush fund. The Public Safety committee of the City-County Council will hold its review and public hearing on the IMPD and IFD budgets tonight, October 6, beginning at 5:30 pm in room 260 of the City-County Building. The overall IMPD budget will see a $7 million dollar drop, due entirely to a reduction in federal grants and stimulus money. Looking solely at personal services (salary and benefits), there is a slight, $1 m, increase over this year, to $164 million. All other budget categories show cuts. The total IMPD budget for 2011 is proposed to be $201 million. The overall IFD budget is proposed to grow by $1.5 million, despite a $1 m drop in federal grants. The personal services segment of the 2011 IFD budget, is proposed to grow by $2.8 m, to $112.8 m. Most other categories decrease. The overall budget totals $126.9 million for 2011. The review of these budgets was postponed from their original schedule, so that this committee could consider several proposals to raise the standards of, and to review the practices of, IMPD, that grew out of recent events. I saw part of that meeting on WCTY, as it was held. I had hoped to review the entire meeting, but my time got spent elsewise. The part of the discussion and review of these proposals that I did see, was one of the most refreshing displays I have seen in some time at the Council. It sure would be nice if this type of cooperation could be the norm. Our community could only benefit.